Parking garages are reputed to be poorly-lit and uninviting places. However, brighter lighting may not always be optimum because of excessive glare and over-illumination. For best lighting practices that increase safety, choose a higher quality light that reduces glare with a high color-rendering index, or CRI. When lighting a parking garage, it is important to tailor light level to location to improve visual clarity, ease eye strain, and increase safety. Lamps with higher CRI render colors more accurately and enable a driver to better distinguish between features and colors within the garage as opposed to casting both pedestrians, vehicles, and walls in the same poor quality light. Altering light levels within the garage also eases eye strain. The entrances and exits to the garage should have the highest levels of light followed by ramp areas. The human eye is highly adaptable; however, it takes a few minutes for a driver’s eyes to fully adjust to a dramatic change in light levels. During the daytime, brightly lit entrances ease the transition from a darker parking garage to the bright outdoors. As the driver continues through the garage, light levels may gradually decrease. Ramps, representing a transition between the brighter, entrance lighting and the darker garage interiors, should be lit accordingly. Finally, low, uniform lighting is sufficient for parking areas. Uniform lighting within the garage interior reduces shadows and contrast, increasing the visibility of pedestrians. 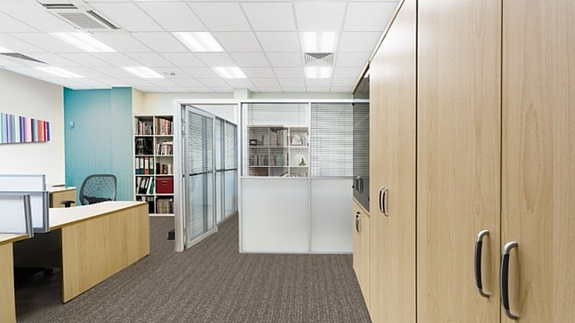 In order to achieve uniform lighting, choose fixtures which emit light upward and downward with wide distributions. A well-lit garage often incorporates physical changes, such as daylighting and paint color, into the lighting system as well. 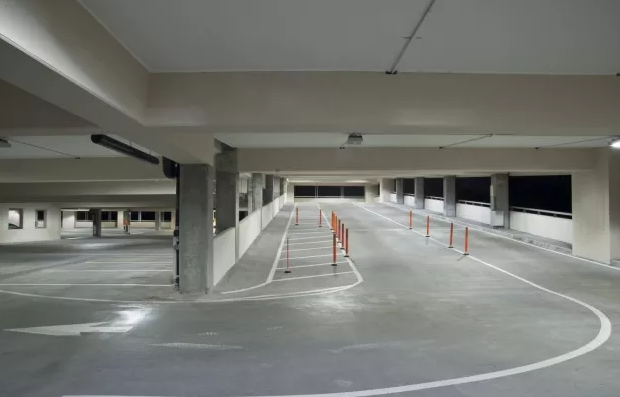 Often parking structures appear dark and uninviting because concrete does not reflect light very well. Wherever possible, paint surfaces light colors to help reflect light. Further, incorporating daylighting into the structure design increases light levels and reduces energy demand during the day. Lighting controls also reduce energy consumption by adjusting light output according to occupant activity and daylight. Some LED fixtures are equipped with occupancy sensors and can dim lamps in areas with less traffic. Photo-sensors can also be incorporated in garage-top lighting to control lighting on the top floor of the structure as well. When incorporating the above recommendations, LED technology is a great option to consider. LED lamps lower energy and maintenance costs, are compatible with a wide range of controls, and have very high color rendering indexes. Many LED options exist specifically for garage applications. These include LED vapor tight fixtures which are optimal in areas where water may get into the fixture and LED garage lighters, which are efficient replacements for metal halide and high pressure sodium fixtures within garages. The improvement that LED technology offers over high pressure sodium (HPS) and metal halide lamps where color-rendering is concerned is substantial. HPS lamps have a CRI of 30 out of 100 and metal halide lamps rank at a modest 60 within the index. LED bulbs, however, regularly have a CRI of 75 or higher. Ditching HPS technology in favor of LED lighting means that your parking garage will never be washed in a orange hue again. Both drivers and pedestrians will be safer once the visual clarity in your garage is improved. If you would like to learn more about lighting control, brightness, or LED technology for your parking application, call 888-455-2800 to speak with a certified Lighting Specialists. Additionally, our blog, The Light Source and our Learning Center are updated with new information regularly. Last week we introduced the topic of Total Cost of Ownership (TCO) for lighting. In the post we showed a simple equation to calculate the TCO of a bulb. The cheaper or less expensive upfront cost of a bulb may not always be the best option in the long run. Factors including the wattage, kWh rate, product cost, rated life, are all considered in your cost of ownership. There are other ways to save when considering a switch to energy efficiency lighting such as LED. In addition to your long-term cost savings, utility sponsored rebates are an excellent way to reduce your upfront or initial costs- further reducing your Total Cost of Ownership. When deciding which light bulb to purchase, the cost of the bulb can be a major factor in your decision. But the cheapest bulb on the shelf might not always be the least expensive option in the long run. The truth is that the bulb you buy will determine your cost in the long term. Some bulbs cost more to use, operate, and maintain than others. These costs, all together, are known as your total cost of ownership. Total cost of ownership (TCO) is a financial estimate intended to help consumers and business owners determine the direct and indirect costs of a product. In terms of lighting, the cost of ownership takes into account the upfront cost of the product, the hours used, kWh rate, and the rated life of the light bulb. Everyone wants to be energy efficient these days: it can help to reduce energy costs- key for all businesses. If you’re happy with the performance, light output, layout, and appearance of your current lighting system then there’s no need for a full replacement of your fixtures. Retrofit kits let you improve upon the existing fixtures without having to go through the time and cost of replacing them. Not only are they fast and easy to install, but they are one of the most cost effective way to save on lighting. Depending on circumstances, they may even qualify for available utility rebate programs.